Teluk Intan is a town located in the state of Perak in Malaysia. It is the largest town in Hilir Perak district and third largest town in the state of Perak with an estimated population of around 120,000, about half of Hilir Perak district's total population (232,900). 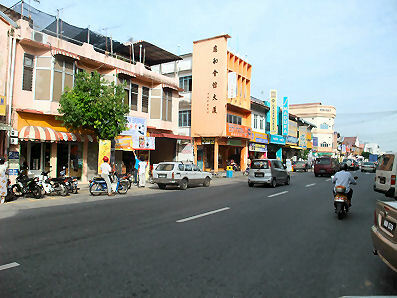 Teluk Intan is the district capital of Hilir Perak district. During the British protectorate era, the named was changed to Teluk Anson (Anson Bay), in honour of a British Officer and last Lieutenant-Governor of Penang, Major-General Sir Archibald Edward Harbord Anson, who drew the plan of the modern township in 1882. One of the town attractions is a Leaning Tower erected in 1885 by a Chinese builder, Mr. Leong Choon Cheong. 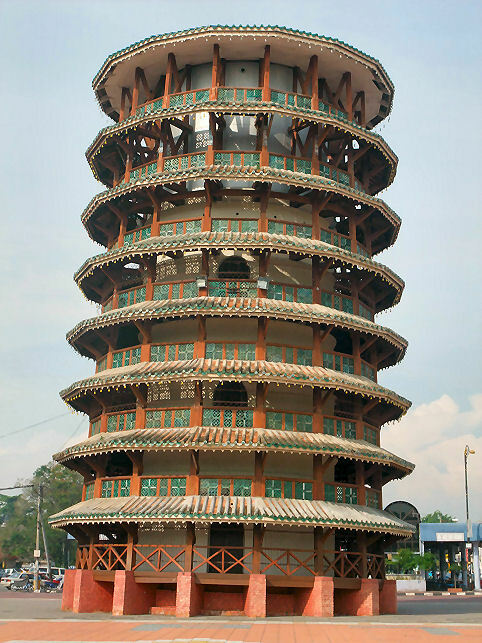 This spectacular leaning clock tower, similar to the world-famous Leaning Tower of Pisa in Italy, is the pride of Teluk Intan. It started to tilt four years after its construction finished due to an underground stream. Initially, it was used as a covered water tank to store water sufficient for 800 Teluk Intan residents at that time. The tower also served as a beacon to guide ships into Teluk Intan Port. During the Japanese Occupation, it was used as an observation post for the Japanese Army. Later, it became headquarters for the Boys Scouts. These days, it just tells the time. Come Wednesdays, the clock tower's caretaker will wind up the clock's mechanism using a crank. Commissioned in London, the clock chimes twice every 15 minutes. The chimes can be heard as far as eight kilometres in radius especially at night. 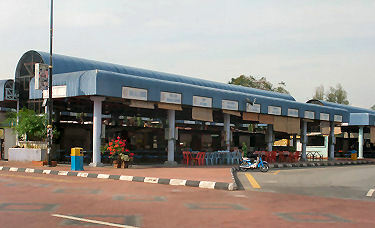 The main street at the centre of Teluk Intan, Jalan Ah Cheong, is named after Leong Choon Cheong to commemorate his contribution. The main economic activities in Teluk Intan are oil palm cultivation and palm oil production. Many plantations around Teluk Intan are owned by big corporations such as Sime Darby and United Plantations. There are some other industries in Teluk Intan including shipbuilding and the textile industry. 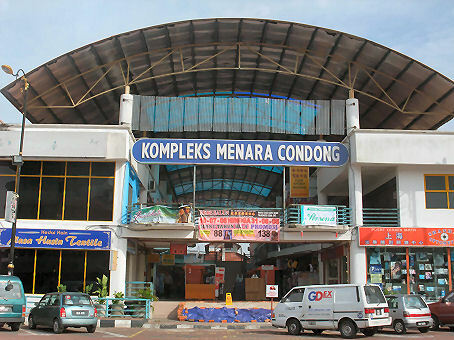 Shopping centres, modern cinema, shops, and educational institutions also bring many people to Teluk Intan weekly. Every Saturday night and Sunday morning, there will be a flea market selling local Malay delicacies. The location is near the Leaning Tower. There is also a famous temple complex in Teluk Intan, known as Hock Soon Keong (Hock Soon Temple) dedicated to Mazu. The origins of the temple are unknown, while the main temple building (not the original one) was constructed in 1883, as indicated by a legend painted on the building. Hock Soon Temple was the centerpoint of all Hokkien Chinese in Teluk Intan during the British colonial era. The local Hokkien people would congregate at the temple to solve all problems, from giving aid to the poor to solving fights between clans. The local Hokkien people used to select three local Hokkiens, usually businessmen and famous men to settle their problems. The temple was built with Southern Chinese architecture, the most notable feature being the beautifully decorated upturned eaves.